starring Jimmy Stewart. It's airing tonight on TCM! There are number of good movies on TV in the next few days. I've prepared a partial list of Christmas specials so you don't miss your favorite! All times are EST so you'll have to adjust accordingly. 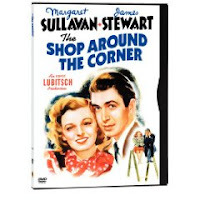 * The Shop Around the Corner - TCM, 6:00 p.m.
* Grandma Got Run Over By a Reindeer - Cartoon Network, 6:00 p.m.
* Casper's Haunted Christmas - Cartoon Network, 7:00 p.m.
* An Oak Ridge Boys Family Christmas - Hallmark, 7:00 p.m.
* Dr. Seuss’ How the Grinch Stole Christmas – ABC, 8:00 p.m.
* In the Good Old Summertime - TCM, 8:00 p.m.
* The 10th Annual A Home for the Holidays with Faith Hill – CBS, 8:00 p.m.
* Prancer - AMC, 8:00 p.m.
* White Christmas - ABC Family, 9:00 p.m.
* A Christmas Carol – TCM, 6:15 a.m.
* Eloise at Christmas - ABC Family, 7:00 a.m.
* Christmas in Connecticut - TCM, 7:30 a.m.
* The Legend of Frosty the Snowman - Cartoon Network, 9:00 a.m.
* Grandma Got Run Over By a Reindeer - Cartoon Network, 10:00 a.m.
* Tom & Jerry a Nutcracker Tale - Cartoon Network, 11:00 a.m.
* Bah-Humduck! A Looney Tunes Christmas - Cartoon Network, 12:00 p.m.
* Holiday Affair - TCM, 12:45 p.m.
* A Scooby Doo Christmas - Cartoon Network, 1:00 p.m.
* Rudolph & Frosty’s Christmas in July - ABC Family, 1:00 p.m.
* Frosty’s Winder Wonderland - ABC Family, 3:00 p.m.
* Rudolph’s Shiny New Year - ABC Family, 4:00 p.m.
* Santa Claus is Comin’ to Town - ABC Family, 5:00 p.m.
* Casper's Haunted Christmas - Cartoon Network, 5:00 p.m.
* The Bishop's Wife - TCM, 6:00 p.m.
* The Santa Clause - Disney, 6:00 p.m.
* The Year without a Santa Claus - ABC Family, 6:00 p.m.
* A Miser Brothers’ Christmas - ABC Family, 7:00 p.m.
* Dr. Seuss’ How the Grinch Stole Christmas - Cartoon Network, 7:00 p.m.
* Miracle on 34th Street - HBO Family, 7:00 p.m.
* A Scooby Doo Christmas - Cartoon Network, 7:30 p.m.
* The Santa Clause 2 - Disney, 8:00 p.m.
* It’s A Wonderful Life – NBC, 8:00 p.m.
* Dr. Seuss’ How the Grinch Stole Christmas/Jim Carrey - ABC Family, 8:00 p.m.
* A Christmas Story – TBS, marathon begins at 8:00 p.m.
* Meet Me in St. Louis - TCM, 1:00 a.m.
* The Shop Around the Corner - TCM, 3:00 a.m.
* The Greatest Story Ever Told - TCM, 9:30 a.m.
* Samantha: An American Girl Holiday - Hallmark, 10:00 a.m.
* White Christmas - ABC Family, 12:00 p.m.
* The Christmas Card - Hallmark, 6:00 p.m. Thanks for this list. We missed most of the Christmas shows. I'm going to dvr them so we have some things to watch.